It’s no secret that this region has a predilection for figurative art. It has been difficult for abstraction to gain regional traction. Perhaps this is because such noted artists as Robert Arneson, Fred Dalkey, Jack Ogden, Jerald Silva and Wayne Thiebaud have lived, taught and worked here, influencing students and patrons alike, or because the inherent marketability of figuration predisposes its representation in gallery and museum shows. The work of Robert Brady has steadfastly cut its own course and exists between figuration and abstraction. His singularly potent, reductive forms evoke the feeling of an entity, rather than its representation. Brady does not concern himself with well-practiced virtuosity. The meaning of his work is found by working through things, not refining them. His direct and elemental work gives form to psychological associations, becoming the agent for empathy and what can be sensed from within, rather than merely seen. 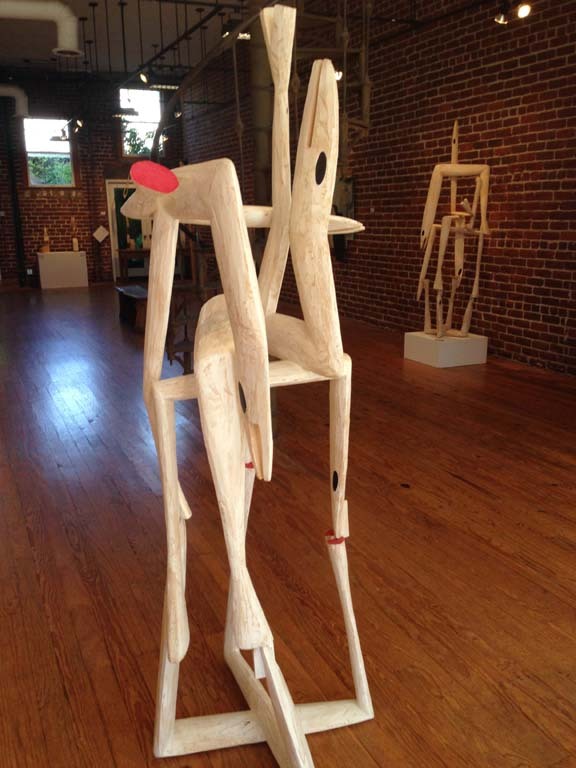 Brady, a Sacramento State University Art Department emeritus faculty member, was first recognized as a ceramic sculptor, but over the years he has expanded his practice, working in wood, ceramic and bronze. This exhibit focuses on recent work in wood, and showcases the extraordinarily delicate, attenuated figurative work for which he is well-known. He uses a vocabulary of shapes that are connotative – expanding and contracting, capable of reinterpretation depending on scale and context. They are derived from the world. Ever since an undergraduate stint in Mexico where he was introduced to Pre-Columbian art, Brady has internalized the precepts of art as an objectification of the spiritual, and that every physical thing can possess power. Three of the strongest works in the show are the moderately sized to large-scale sculptures, “Teem” and “Teem, 2” (both 2017) and “Bode” (2015). They are carved from pale, bleached wood. The minimal, unadorned and elongated tubular forms possess the animated gesture of writhing fish, either spawning upstream or flipping and gasping for air in polluted water. Brady doesn’t fuss with his surfaces. The carved and planed forms are articulated with only flatly painted lamp black ovals for eyes. Black discs are interlocked within the fish forms of “Bode,” suggesting disruptive hurdles or metaphorical barriers to life. But their formal subtext, linking mass to plane to line to space, is what lingers long after the narrative has been absorbed. Their inherent abstraction is the work’s abiding strength, and where I suspect Brady’s real interest lies. Critical to experiencing Brady’s work is the placement of work within the room and how the viewer encounters it. The particular height of work off the floor and its distance from the wall and to other works create meaning and context. A group of long, slim, Giacometti-esque standing figures is staged on pedestals individually crafted to each figure. Titled “Angels,” they appear to loom and lope – mute, inscrutable actors in the firmament between and slightly above us. Like most of the work throughout the show, these lean figures are deceptively simple. But simplicity is hard. This seems counterintuitive, but simplicity requires acute attention to each nuance, tone and shape. Everything matters. No aspect of the work is merely decorative or without purpose, and once purpose is achieved, it is left to stand without equivocation. A suite of small, wall-mounted quirky little men called “Marconis” pay whimsical homage to the inventor of long-distance radio transmission. Both rough-hewn and refined, they hang on the wall in a sitting position but without a chair for support. Tall conical hats, wire wands and pseudo-scientific oddments sprout from their heads. Using wood, flat paint and scavenged bits of metal, the works appear doll-like, yet possess an unexpectedly potent intensity as if they might be capable of actual transmission. Less interesting are small pedestal pieces of flying birds or insects made from brushes or brooms. They’re clever and well done, but without the searching urgency or necessity that the larger works possess. Brady doesn’t need them. It is more than enough to encounter the smart, terse large-scale sculpture that so succinctly activates the gallery. WHERE: b. sakata garo, 923 20th St.